British actor Warwick Ashley Davis’ roles have taken the veteran actor from his roots in Surrey, England, to galaxies far, far away, to the magical world of J.K. Rowling’s Hogwarts, and to C.S. Lewis’ fantastical land of Narnia in a career spanning almost three decades. Collectively, the films he’s been in to-date have grossed over $6.75billion worldwide, currently making Warwick the eighteenth highest grossing actor in the world. Warwick (born 3 February 1970) is probably best known for his roles as the title character in the classic adventure movie Willow (1988, nominated for two Oscars) which also starred Val Kilmer, as well as Wicket the Ewok in Return of the Jedi (1981). He has since acted alongside David Bowie in Labyrinth (1985), played three characters in Star Wars Episode 1: The Phantom Menace (1999), including several scenes as Yoda, and played the lead role in the six Leprechaun horror films which have attracted a cult following. 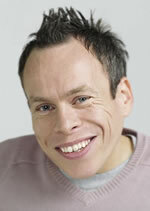 Warwick also became the jazz performer Oberon for the Oscar-winning biopic Ray (2004), Marvin the Paranoid Android in The Hitchhiker's Guide to the Galaxy (2005), Professor Filius Flitwick in all six of the Harry Potter movies and the dwarf Nikabrik in the 2008 film adaptation of The Chronicles of Narnia: Prince Caspian. UK TV credits include Reepicheep in the BBC television versions of Prince Caspian, Voyage of the Dawn Treader and Mr Glimfeather the owl in The Silver Chair. In 2006, he appeared as himself in an episode of the second series of Ricky Gervais’ BAFTA-winning sitcom Extras. In the USA, he featured in the groundbreaking Emmy-Award-winning The 10th Kingdom and the NBC telefilm Gulliver’s Travels (co-starring opposite Ted Danson) and Snow White. 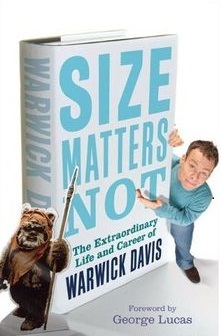 Warwick runs Willow Management, an agency that represents actors below five feet and over seven feet tall. He is currently working on a sitcom loosely based on the agency and his everyday life, and has two self-produced films in the pipeline, including a crime caper called Shortfellas. Warwick, who is three-feet-six inches tall, has an extremely rare genetic condition called spondyloepiphyseal dysplasia congenita. He is married and lives in the UK with his wife, Sam and their two children, Annabel and Harrison.